I had lost complete confidence in Al as VP of Engineering. Product deadlines were constantly being missed, and products delivered were not meeting the specifications. Just after Dennis left I created a new “Strategic Planning” position and put Al in it. I then did a complete reassessment of the engineering department. From 1988 until now the engineering team had grown rapidly. While some members of the team were very talented and capable, some were not. I had found when I managed large projects at Burroughs about a decade earlier that a small number of underperforming engineers could derail an entire team. Since our sales had not met expectations we were overstaffed, the company needed to layoff some employees to bring our budget back in line. I used this opportunity to clean house in engineering. I then conducted a bottom up review of all projects in engineering. I had promoted Mehran Ramzani to Engineering Manager reporting to me. Mehran was a capable engineer but not a seasoned executive. I stepped into the Engineering Management job. The team and I found that there had been quite a bit of duplication of effort. I decided to standardize on a hardware and software architecture that we could use across all the projects in process. This freed up manpower and allowed the engineers to concentrate on getting the designs right the first time by using proven design modules. The result was rapid progress on all fronts. Development schedules were cut in half, or more. While Al was a hard worker, he had trouble motivating the Engineering team to be as hard working as he was. I worked closely with engineering for another year until I had a lucky break. My old General Manager at Burroughs, Erv Hauck became available as Burroughs was downsizing. He had been General Manager of the semiconductor plant in Rancho Bernardo, but had decided to retire after they began downsizing. I asked him if he would be willing to be my V.P. of Engineering. He agreed. He joined Future Domain in June of 1992 as VP of Engineering and I had Mehran report to him. This completely alleviated me of the need to run Engineering on a day to day basis. Erv knew how to talk to customers and motivate engineers and get projects done. Once the other departments of the company began seeing products coming out of engineering on schedule and that worked well moral improved. I moved customer support and sales engineering under Patty, and customer satisfaction improved significantly. Now that engineering and support were delivering we were back on track. However it took time for new products and renewed sales efforts to take root. 1991 was a difficult year, sales were improving but because of the high cost of the 16 bit product our margins declined. We had layoffs in early 1991 to bring our costs in line with our revenue. These layoffs impacted the whole company, including Engineering. It was difficult but needed to be done to turn around the company and buy time for my new strategy to take hold. By the middle of 1992 I had completely revamped the product lineup. We relaunched our sixteen bit product line with the new 18C50 chip that, while still too expensive, was more cost competitive and fully supported the SCSI-2 10MB/Sec specification. 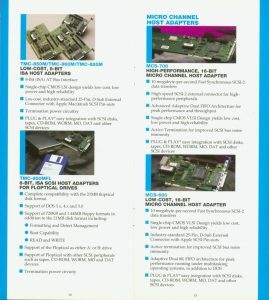 With FAST SCSI-2 we had leapfrogged Adaptec and disk drive vendors were again using our product as it was the only one that worked with the FAST feature. 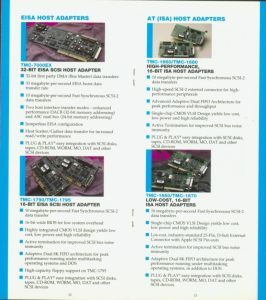 I added an EISA version of the sixteen bit product, and a bus master sixteen bit and thirty two bit product we purchased from Western Digital. Our eight bit line was cost reduced by the 9C50 chip that allowed it to continue to be competitive in very low cost environments like CD-ROM. Finally, our Microchannel adapter was now based on our 18C50 chip and became the IBM industry standard. In less than a year and a half, I had put us back in the ballgame. But I did not wait for these products to be ready; I hit the road in 1991 to begin closing new OEM sales critical to our recovery.